News Quiz: Why All The Fuss About The Iowa Caucuses? 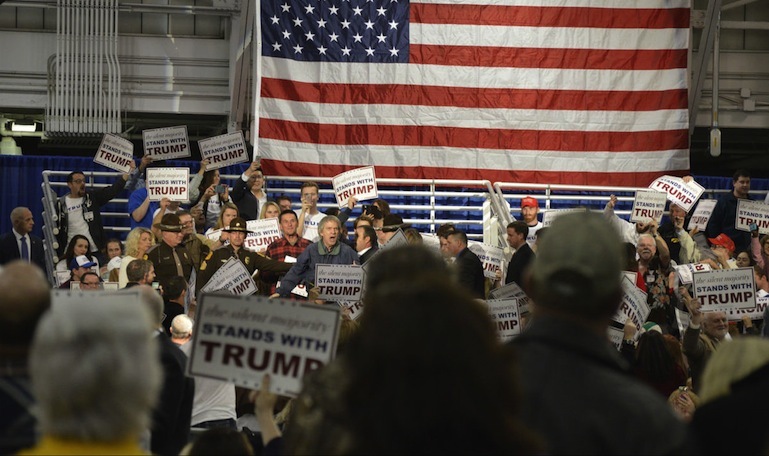 A protestor is escorted out by Secret Service and the Iowa State Patrol after interrupting a town hall with Republican presidential candidate Donald Trump at the Iowa State Fairgrounds in Des Moines, Iowa on Dec. 11, 2015. Candidates spent this week trying to get in the last word before Iowans head to the caucuses on Monday — the first time voters get to weigh in on the nomination process. Each state has its own way of determining which candidate from the Republican and Democratic parties will get support. These three questions should help you understand Iowa’s method – the precinct caucuses. Quiz By: Lyle Muller/IowaWatchSource: Des Moines Register; 'Why Iowa? How Caucuses and Sequential Elections Improve the Presidential Nominating Process,' by David Redlawsk, Caroline, J. Tolbert and Todd Donovan (University of Chicago, 2011); Iowa Democratic Party, Iowa Republican Party; 'Does Anyone Remember That Tom Vilsack Ran for President in 2008?' by Carol Felsenthal, Huffington Post, July 26, 2010.